I decided to start my Lenten give-away with shoes. I thought this would be relatively easy since I’m not a big collector of shoes – or so I thought. According to Soles4Souls, the average American owns 13 pairs of shoes. I figured I was probably under that and could go lower. Wrong. 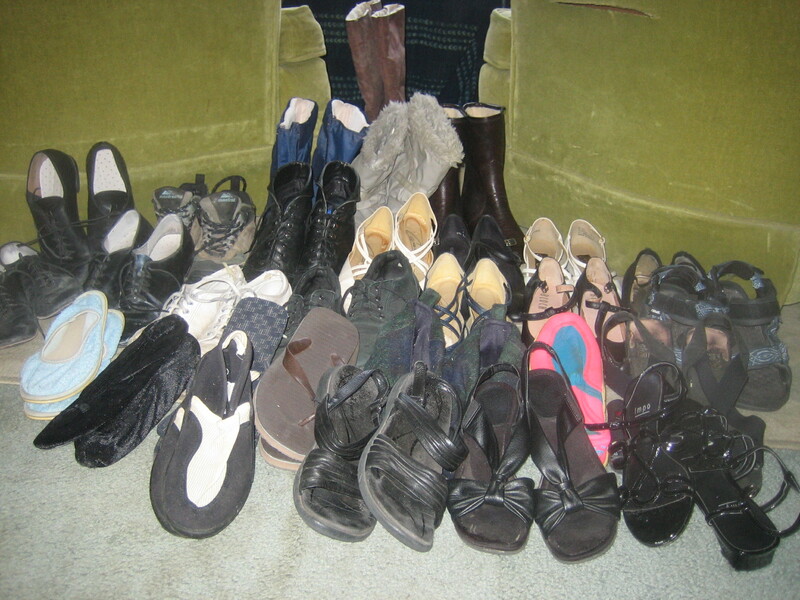 When I added up all my shoes (including slippers and boots), it came to 30 pairs. I was horrified! I pruned it down to 13 but I’m not happy being average. In a typical week I only wear 5 pair. I’ll have to think about this. Soles4Souls can direct your gently used shoes to a good home. When I shared my shoe progress with a friend, he gently said, “Well, I only have two pairs of shoes. These athletic shoes that I wear for casual, dancing, and work (since I work outdoors) and a pair of dress shoes.” I don’t think he was counting boots and slippers, but I feel humbled regardless. Larry did admit that his wife, who works in an office, has more shoes for a professional look. I think I’ve met a true hero. #2 | Written by Kathy B about 9 years ago. Tablecloths are a passion of mine. My idea of a great present is a new tablecloth, and since our table expands, I need two or three different sizes. I went through them and let loose of four of them. It’s hard! They all have purposes and memories attached. But the drawer closes more easily now! #3 | Written by Janet about 9 years ago. I think I’ll leave shoes for a later date! Today I started with one file drawer in a file case we moved from MD. Lots of professional stuff that I was involved with in the 80’s and 90’s. Since I’m retired now none of this is relevant any more. It was a bit of a life review as I went through different folders and thought about the people and situations that touched my life then. At least two of those people are now deceased. Both nurtured me professionally and personally. May they rest in peace. So, day 1, a little less clutter and a little more space for the Spirit to move in.